As Eugene's oldest and most established OLCC-licensed dispensary, we have had a deep dedication to empowering our customers, patients, and this community with cannabis knowledge since 2012. We are open to the public (21 and older with valid ID) and to OMMP cardholders 18 years or older. Our friendly, knowledgable budtenders are always here to ensure you get what you're looking for. We believe education is key in the public's understanding of cannabis and in eliminating the stigmas surrounding it, so we give each customer and patient individual attention to answer any and all questions. Fox Hollow Flora will be here at The Greener Side from 4-7pm, come say high and get 20% off all Fox Hollow flower! The industry's premiere charity golf tournament benefitting MS research! 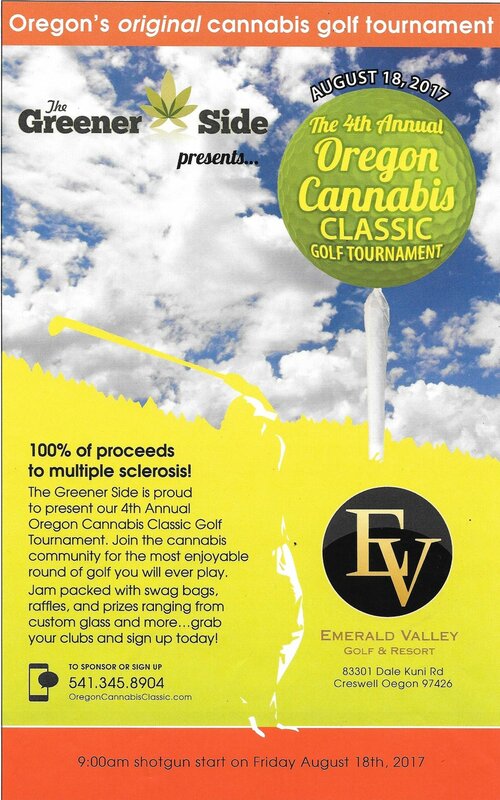 Last year, we had booths from Illuminati Medicinals, NW Kind, Imperial Extracts, Geek Farms, and more while raising over $7,500 toward Multiple Sclerosis research. You don't have to be a cannabis professional; all are welcome to donate, participate, and volunteer!